Bike Rider Quotes and Sayings in English: If you truly love Bike Riding than you are at correct page, this collection is created for you, quotes for bike stickering even quotes for bike number plate. Whenever you need such collection, just visit our blog and enjoy the collection! 1. Two wheels move the soul. 2. Dirt is for riding. Pavement is just to get you there. 3. It’s not a race. It’s a journey enjoy the moment. 4. Anybody can jump a motorcycle. The trouble begins when you try to land it. 5. If you don't live for something you'll die for nothing. 6. Don't limit your challenges. Challenge your limits. 7. Four wheels move the body. Two wheels move the soul. 8. 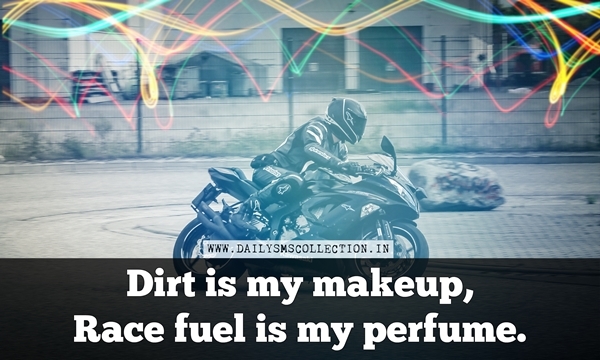 Dirt is my makeup. Race fuel is my perfume. 9. Feminity for me was discovering you when I took you for a ride on my bajaj discover. 10. Truly, the bicycle is the most influential piece of product design ever. 11. Nothing compares to the simple pleasure of a bike ride. 12. Riding bicycles will not only benefit the individual doing it, but the world at large. 13. Cycling has encountered more enemies than any other form of exercise. 14. Ride as much or as little, or as long or as short as you feel. But ride. 15. The sharpest minds often ruin their lives by overthinking the next step, while the dull win the race with eyes closed. 16. You can’t buy happiness but you can buy bikes and that’s kind of the same thing. 17. Bikes don't leak oil they mark their territory. 18. Drop the gear and disappear. 19. Run the race of your life at your own pace. 20. I'd risk the fall just to know how it feels to fly. 21. Life is like riding a bicycle. You don’t fall off unless you plan to stop pedaling. 22. Bicycles are almost as good as guitars for meeting girls. 23. Bike have no walls. 24. Never use your face as a brake pad. 25. Take the journey, soar like an eagle, there are so many roads to explore and so little time. 26. Life is short. So grip it and rip it. 27. Death may have no master, but the bike is, most emphatically, not its slave. 28. Save the planet. Ride a bike. 29. Families that race together stay together. 30. Racing is life everything else is just waiting. 31. Don't count laps. Make every lap count. 32. You don’t suffer, kill yourself and take the risks I take just for money. I love bike. 33. If constellations had been named in the 20th century, I suppose we would see bikes. 34. Think of bicycles as rideable art that can just about save the world. 35. The bike is the noblest invention of mankind. 36. You can't be sad while riding a bike. 37. Anybody can jump a motorcycle. The trouble begins when you try to land it. 38. Life may not be about your bike, but it sure help you get through it. 39. Ride as much or as little, or as long or as short as you feel. But ride. 40. A mountain bike is like your buddy. A road bike is your lover. 41. A bicycle ride is a flight from sadness. 42. Brains before beauty, wear your helmet! 43. Cycle tracks will abound in Utopia. 44. It never gets easier, you just go faster. 45. There is nothing, absolutely nothing, quite so worthwhile as simply messing about on bikes. 46. I like riding a bicycle build for two by myself. 47. Don’t buy upgrades, ride up grades. 48. Everyone crashes. Some get back on. Some don't. Some can't. 49. You can't buy happiness but you can buy bikes and that's kind of the same thing. 50. Life may begin at 30, but it doesn't get real interesting until about 150. 51. I don't ride a bike to add days to my life. I ride a bike to add life to my days. 52. To live is the rarest thing in the world. Most people just exist. That's why we ride. 53. Work to eat. Eat to live. Live to bike. Bike to work. 54. When you’re turning the crankset, you’re riding the bike. When you’re coasting, you’re just along for the ride. 55. A raggedy ride beats a dressed up walk. 56. The best rides are the ones where you bite off much more than you can chew and live through it. 57. Take the journey, soar like an eagle, there are so many roads to explore so little. 58. If I weren't doing what I'm doing today, I'd be travelling around the world on the back of a motorcycle. 59. The sharpest minds often ruin their lives by overthinking the next step, while the dull win the race with eyes closed. 60. I love my bike more than my girlfriend. 61. Four wheels move the body. Two wheels move the soul. 63. Put the fun between your legs. 64.What a glorious day to just ride! 65. A motorcycle is an independent thing. 66. Keep the paint up, and the rubber down! 67. Save some money, go for a ride. 68. A man without a woman is like a bird without a bike. 69. If you ride like there's no tomorrow, there won't be. 70. Llllllloooollllll. i saw a donkey on a bike. 71. no road is too long when you have good company. 72. Life may not be about your bike, but it sure can help you get through it. 73. Get a bicycle. You will certainly not regret it, if you live. 74. Like dogs, bicycles are social catalysts that attract a superior category of people. 75. Life is like bike to keep your balance you have to keep moving. 76. Keep calm and bike on. 77. Life is a beautiful ride. 78. The best routes are the ones you haven't ridden. 79. if you worried about falling off the bike, you'd never get on. 80. Keep your bike high. and your head higher. 81. Blood sweats & gear. 82. Anyone who rides a bike is a friend of mine. 83. Got in a wreck with a smart car today, its totaled. My bike is fine though. 84. Why can't a bike stand on its own? Because it is two tired. 85. Cheating is not an accident guys. Falling off a bike is an accident. 86. Anybody can jump a motorcycle. The trouble begins when you try to land it. 87. You do not need a therapist if you own a motorcycle, any kind of motorcycle! 88. Do not compete with anyone in the race of life. Compete with yourself. 89. Run the race of life set for you with all your very best. 90. Nice people rides bike. 91. Keep riding bike because it's weekend. 92. The awkward moment when you are on a bike and get hit by a car a parked car. 93. I enjoy going on motorcycle trips and stopping in small towns and enjoying drinks with the locals. 94. It wasn't until I went to college and I got my first motorcycle that I understood the thrill of speed. 95. If I weren't doing what I'm doing today I'd be traveling around the world on the back of a motorcycle. 96. Anybody can jump a motorcycle. The trouble begins when you try to land it. 97. Life is like a ten speed bike. Most of us have gears we never use. That is why only a select few succeed. 98. My son wasn't too pleased about me giving him a bath earlier. Apparently he wanted a bike for his birthday. 99. It's all of us against cancer this year so show your support of Cancer Research UK’s Race for Life and tell us your story here. 100. The sharpest minds often ruin their lives by overthinking the next step, while the dull win the race with eyes closed. Related Tags: Bike Stickering Quotes in English, Nice Quotes for Bike Stickering, Quotes for Bike Number Plate, Bike Ride with Girlfriend Quotes, Bike Rider Quotes and Sayings, Bike Riders Quotes and Sayings, I Love My Bike Quotes, Bike Stickering Quotes in English, Bike Ride With Boyfriend Quotes, Bullet Bike Quotes in English.